Rod Stewart has been announced as the headline act on the Sunday night at Hard Rock Calling. Rod Stewart's appearance at the Hyde Park festival will mark the climax of a series of open-air concerts for the gravel-voiced crooner this June. 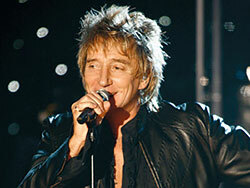 Rod is also due to perform at football stadiums in Swansea, Aberdeen and Norwich, prior to the Hard Rock Calling gig. With seven number-one singles and countless other hits to his name, Rod Stewart is sure to get the crowds going this summer. Rod will perform at Hard Rock Calling on Sunday 26th June. Tickets to see Rod Stewart at Hard Rock Calling will go on sale at 9am on Friday 11th March.